Q: iTunes could not connect to this iPhone. The value is missing. I’ve just attempted to restore my iPhone as it was in DFU mode and now I get the error "iTunes could not connect to this iPhone. The value is missing." And the phone is stuck on the apple logo. Any ideas? 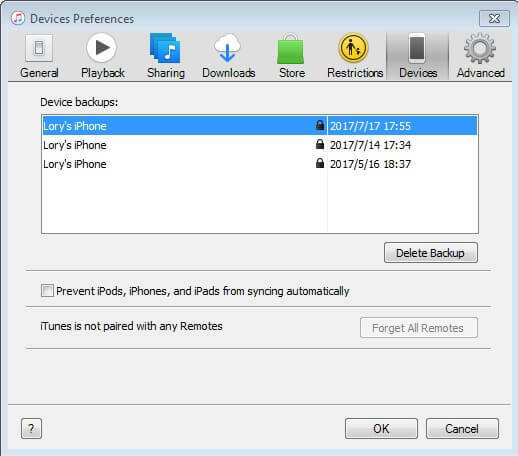 During the using of iPhone, users often need to connect iTunes to backup or restore their iOS devices. Recently, there are lots of users who received the notice that “iTunes could not connect to this iPhone, the value is mussing.” If you have no idea to solve this problem, you may refer to the following solutions to get this issue fixed. In most of the cases, users got their functional iPhone X/8/8 Plus/7/6/5 into DFU mode and find iTunes could detect their iOS device, thus we suggest you firstly to get all the application up to date, especially iTunes. You can follow the steps to check your iTunes version and get it updated. After you have get the latest iTunes, you then may connect your iPhone with iTunes again. During the usage of iTunes, improper operation may cause data lose. Reinstall iTunes to your PC/Mac can be a good choice, and you can have a try. Note: For users who cannot normally install iTunes onto PC/Mac, you can get help from Tenorshare TunesCase, this all-in-one iTunes repair tool will assist you to fix all iTunes syncing problems and iTunes errors free. Also, a simple restart can help to fix kinds of problems, so you can also get your computer restarted during the process and try to connect your iPhone with iTunes via USB again. If you have tried times to fix iTunes but find the problem still exist, then problem may lay on your iPhone. Here we suggest you to have a try by using Tenorshare Any iOS System Repair (ReiBoot), a professional iPhone saver which can help to fix all kind of iPhone stuck and provide one-click solution to boot up your iPhone/iPad/iPod back to normal. Step 1: Download and install Any iOS System Repair (ReiBoot) on your PC/Mac, connect your iPhone with your computer and you may see the interface below. You are required to click “Enter Recovery Mode”. Step 2: Wait for around 20 seconds and your device is entered recovery mode successfully. There will be an iTunes logo and a USB cable display on your device’s screen. And “Exit Recovery Mode” option is highlighted. Click it to reboot the stuck device. Step 3: Wait for iPhone reboot and you can enter DFU mode again to connect to iTunes for restore your iPhone X/8/8 Plus/7/6/5 or do other task. That’s all about how to fix “iTunes could not connect to this iPhone, the value is missing.” No matter this problem comes with your iPhone X/8/8 Plus/7/6/5 or iPad/iPod, you will sure get this matter fixed after read this article.